Home / Simonton Windows / Why Simonton Windows? An investment in new replacement windows and doors will completely transform your home. When choosing Simonton Windows, you are choosing an industry leader. 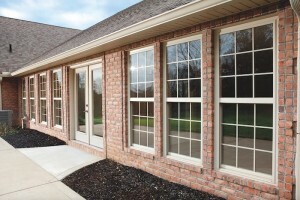 Simonton Windows are some of the best vinyl windows in the industry. Recognized by Consumer Reports as one of the most leading and innovative products in the industry, and also a long-standing ENERGY STAR partner. Simonton produces quality replacement windows and doors that only 70 years of innovation and experience can deliver. As an ENERGY STAR® partner, Simonton windows and doors only use energy-efficient glass that keeps heat inside during cooler months and outside during warmer months. 2. Industry’s leading warranty – The quality of our windows and doors is proven time and time again and also backed by one of the best warranties in the industry. 3. Customized Replacement Windows & Doors -Simonton windows and doors are available in custom colors or woodgrain styles. Add even more customization with grid patterns and hardware. 4. Resale Value – According to Remodeling Magazine, if you invest in vinyl windows, you can recoup up to 73% of your cost. Every detail has been designed to provide durable, quality vinyl windows and doors that are energy efficient, weather resistant, and low-maintenance. Choosing Simonton windows and doors is more than just a transformative addition to your home. We are dedicated to bringing top-notch service to our clients. We are one of the most affordable contractors, no-bait and switch, owner installs every window, (no-subs) owner doesn’t hired commissioned sales team, no-hype, no-gimmicks. Best Windows, Best Price, Best Service. Bottom line, no-hassle, in-home consultations. Don’t wait – call Jeff today for your consultation. 770-318-8514.